I've mentioned before that I lost my Nana in the spring. The last few weeks, my mum and her siblings have been cleaning out Nana's apartment and saying good bye to her things. Really, when you look at what's around your house/apartment, they really are just things. In the grand scheme of life, many of the "things" you surround yourself with don't really matter. However, there are some "things" that were not only special to my Nana but special to people in her life that remind them of Nana. 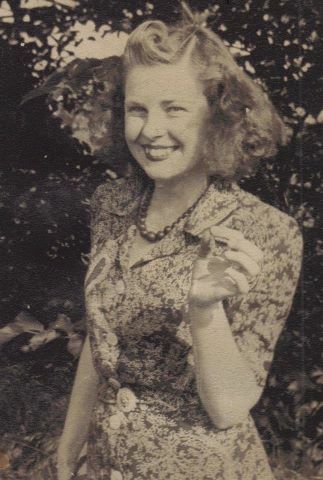 This is my Nana...wasn't she beautiful? She was a gift to the world and I loved her very much. So, between Nana's four children, 8 grand-children and 2 great grand-children, everyone received treasures of Nana's that they loved and reminded them of her. We are so lucky. Here are some of Nana's treasures that we are finding special spots in our homes. Nana had some beautiful furniture. I love occasional chairs and this one was always a favourite of mine at Nana's house. Its a Victorian Swan Chair. It was my Nana's mum's chair (so we're talking 1800s). LOVE. All it needed was to be recovered, so yesterday my mum and I did a little DIY...You may remember the White Chair DIY from a couple of months ago. Here is the chair BEFORE. The wood is gorgeous in it, the lines are beautifuly carved and the swans in the back...J'aime. Mum and I took off the red fabric and check out the strappings...so old. We looked under the cotton batten and it was stuffed with horse hair and straw! Very cool. Now that's OLD!! Check out how the chair is held together with the dowells. They dont make them like that anymore. We took out most of the tacks (see all the holes...clearly this chair had been recovered many times). We used the red fabric as a guide to measure our new fabric. We happened to be in Ikea a couple of days ago and found this pretty fabric (have you checked out their fabric section? Its fantastic and the prices can't be beat!). This fabric was 8.99/m!! How is that possible? Here are some tips for recovering a chair cushion. Iron your fabric and then lay it under the cushion and make sure it straight. Using your staple gun, pull one side of the fabric taught and staple to the frame of the cushion. Next, pull the opposite side taught and staple. Next, you can either do the two other sides or start on the corners. We started on the corners. This can be tricky. You want to make sure that there are no bumps or grooves when you pull it so it takes a bit of folding patience and trial and error. You'll get it! The cushion fit back on the chair perfectly and VOILA...a fresh.fabulous.sophisticated chair that looks beautiful in my living room and will always remind me of Nana. What's old is new! Take the time to look at items of the past that may bring back memories and create new ones. I'll definitely be blogging about some of Nana's other treasures as they find their new homes in my rooms. I have two more chairs that are now in our guest room so they'll need cushion recovers too. Do you have treasures of family members that you love? I would love for you to share them with me in the comment section. Dont forget to follow me by clicking "join this site" on the right hand side of the blog. Gorgeous DIY chair, I'm going to check out the rest of your blog! I hope you enjoyed SoCap! I agree with Lara, you do look just like your Nana! I love the new fabric on her chair and thanks for the tutorial on how to do it. I refinished my dining room chairs a couple years ago (before blogging so I have no before or after pics) and I'm not totally happy with how they turned out. I want to refinish the wood on the whole set so will use some of your tips to do the seats again. I'm following you now, a fellow blogger from Ontario. Found you over at Serenity Now.